Attorney General Jeff Sessions resigned Wednesday, creating a vacancy in President Donald Trump’s Cabinet and the opportunity to confirm a new leader at the Department of Justice. The question facing Trump is who he might pick as the next attorney general. The Heritage Foundation’s John Malcolm, vice president of the Institute for Constitutional Government and director of the Meese Center for Legal and Judicial Studies, discussed the following dozen possible candidates for the position during recent TV interviews. Bondi, 52, is Florida’s attorney general, a position she has held since 2011. Previously she served as an assistant state attorney. She was a part of a 2018 lawsuit by 19 states to overturn the Affordable Care Act and has also served as a Fox News co-host. Malcolm called Bondi “terrific and outgoing,” “very, very bright,” and a “rather dynamic personality,” noting he thinks she served her state well and is often a speaker at conservative events. “I have no doubt that she’d do an excellent job if she got the nod,” he added. Ratcliffe, 53, is the representative for Texas’ 4th Congressional District, a position he has held since 2014. In 2004, former President George W. Bush appointed him to serve as the Justice Department’s chief of anti-terrorism and national security for the Eastern District of Texas. 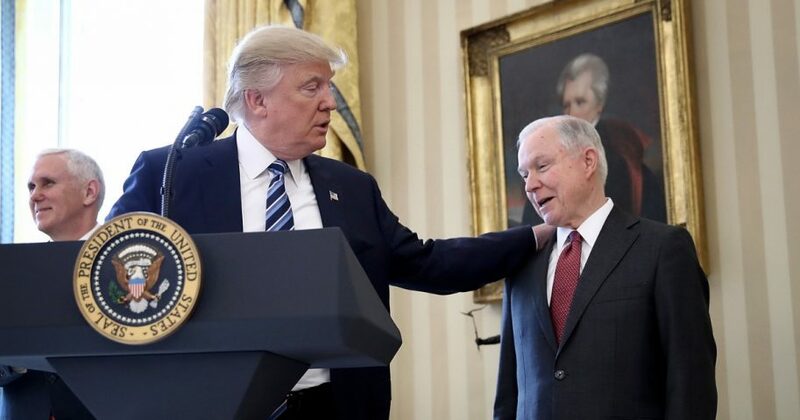 Do you think it is good that Sessions resigned? Malcolm said Gowdy “would receive a serious look” for the position of attorney general because he was the federal prosecutor in the District of South Carolina from 1994 to 2000 and was later the district attorney for the state’s 7th Judicial Circuit. Gowdy, 54, currently serves as the representative for South Carolina’s 4th Congressional District and rose to national prominence for his role in leading the U.S. House select committee established by Republicans to investigate the attack on the U.S. consulate in Benghazi, Libya. In January, he announced he would not seek re-election to the House and instead restart his legal career. Brown, 69, is a former judge on the U.S. Court of Appeals for the D.C. Circuit. She was appointed by Bush in 2003 and confirmed in 2005. She retired in August 2017. Brown was also an associate justice of the California Supreme Court from 1996 to 2017. She is known for her conservative judicial philosophy. Graham, like Gowdy, hails from South Carolina, having served as its senator since 2003. Graham, 63, is a retired U.S. Air Force Reserve colonel and has also served in his state’s House of Representatives and the U.S. House of Representatives. “Lindsey Graham would also do an excellent job. He knows the Department of Justice extremely well,” Malcolm said. Even though he often criticized Trump during the 2016 election and at the beginning of his term, “he certainly did a tremendous job during the Kavanaugh hearings and has been very supportive of the president,” Malcolm added. Graham recently said he would not accept an offer by Trump to succeed Sessions, noting he was happy serving as a senator for the time being. Jones, 69, has been a judge for the U.S. Court of Appeals for the 5th Circuit since her appointment by former President Ronald Reagan in 1985. She served as that court’s chief justice from 2006 to 2012. Luttig was a judge on the U.S. Court of Appeals for the 4th Circuit from 1991 to 2006 when he resigned to work for Boeing Co. He has served in the Reagan and George H.W. Bush administrations and once clerked for now-deceased Supreme Court Justice Antonin Scalia when Scalia was a judge on the U.S. Court of Appeals for the D.C. Circuit. During his time in the Bush administration, he worked in the Justice Department and assisted then-Supreme Court nominee Clarence Thomas through his confirmation hearings in 1991. Luttig, 64, is considered to be conservative in his judicial philosophy. He was once on President George W. Bush’s shortlist for the Supreme Court, and many of his law clerks have clerked at the Supreme Court. Acosta, 49, currently serves as Trump’s secretary of labor. Before his appointment to that position in 2017, he served as the assistant attorney general for civil rights and federal prosecutor for the Southern District of Florida. Acosta is the only Hispanic in the president’s Cabinet. Whitaker, 49, is the current acting attorney general in the wake of Sessions’ departure. He was the Senate-confirmed U.S. attorney general from Iowa, where Malcolm said he “served with distinction” from 2004 to 2009. He also served as a U.S. attorney under former President George W. Bush. Malcolm noted that for the last year Whitaker has served as Sessions’ chief of staff, so he knows the political appointees at the department and has a relationship with the president himself. Azar, 51, is the secretary of the Department of Health and Human Services under Trump. He previously served in the George W. Bush administration. Christie, 56, was appointed to be the U.S. attorney for New Jersey by Bush, and served in that capacity from 2002 to 2008. He later served as the state’s governor and presided over the Fort Lee closure scandal, during which he was accused of shutting down a major highway as a form of political retribution. Malcolm said that while Christie and Trump have known each other for a long time, it remains to be seen whether the president will find Christie attractive for the job of attorney general given his high public profile and “larger than life” persona. Giuliani, 74, is a former U.S. attorney general and mayor of New York City. He currently serves as the president’s outside legal counsel and has made frequent (and oftentimes newsworthy) media appearances defending the president on the Mueller investigation and adult film actress Stormy Daniels’ lawsuit against him.